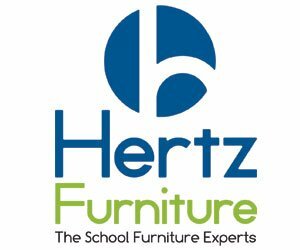 Hertz Furniture, the premier school and office furniture supplier, carries a full range of wheelchair accessible and ADA-compliant products, helping schools provide equal learning opportunities and accommodate students of all abilities. From wheelchair accessible tables and desks to computer work centers which allow students with physical disabilities to study alongside their peers, Hertz Furniture's growing line of ADA-compliant furniture enables all students to work on an equal footing – in the classroom, science lab, cafeteria, and even in the playground. In contrast to previously held concepts of mainstreaming and integration, wherein students with special education needs would gradually earn their way into the mainstream, in the inclusive education model, students with special needs spend all or most their time in the same classroom as their peers. To facilitate full participation by students with disabilities in school settings, Hertz furniture offers classroom desks and tables such as Lesro folding wheelchair tables, which are height and angle-adjustable and feature a raised edge to prevent writing utensils and books from rolling off. Wheelchair accessible drafting tables by Mayline Stoway fold flat for easy storage and mobility, and are ideal for open artwork and other large projects. For science period, teachers and students will especially enjoy height-adjustable science lab tables by Diversified Woods, made with chemical-resistant tops for safe experimentation. Hertz Furniture's accessible computer workstations are available with wheels for convenient portability between classrooms or with glides for use in one place. Extending ADA-compliance beyond the classroom, inclusive schools might also want to invest in wheelchair accessible picnic tables, allowing students of all abilities to enjoy recess and lunch together. Furthermore, to ensure that no student feels singled-out, different or left behind, the accessible furnishings are designed using colors and styles which match regular classroom furniture and double as regular desks and work tables, making them a practical and cost-effective investment for schools. "Nowadays, schools and workplaces are required to provide environments which accommodate individuals of all abilities," says Hertz Furniture President Saul Wagner. "Our wheelchair accessible products ensure that all students receive the same high-quality education and that they feel welcome and accepted in the classroom. We hope our expanding line of ADA-compliant products allow all schools to provide inclusive education."